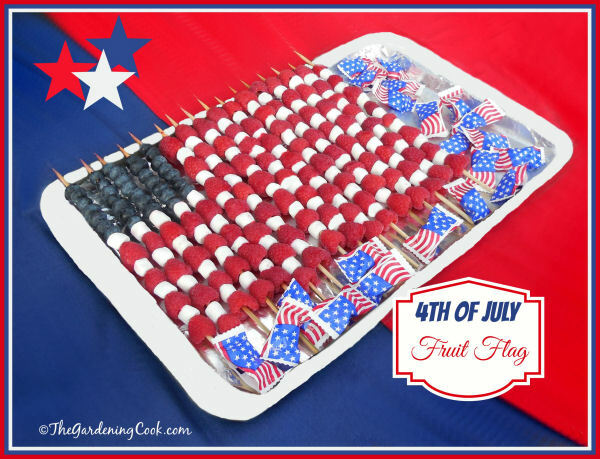 Impress your Friends with a Patriotic Fruit Flag. We had friends over for brunch on Sunday, and I wanted to add a festive patriotic accent to our table since the holiday is just a week away. I wanted something that we would eat (I hate wasting food on craft projects unless I plan to serve them.) 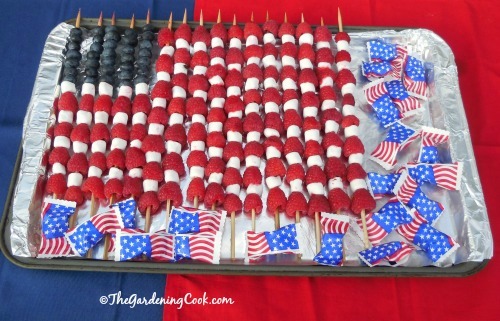 What better choice for brunch than this patriotic fruit flag? And isn’t it nice to celebrate with dessert in a healthy way that is still a pretty plate on the table? I made the flag the day before. Then I just covered the whole thing with aluminum foil and put it in the fridge. It was perfect the next day and saved me a lot of time on the morning of my party. The first step is to make the star section. You will need five skewers for this part. Start from the bottom and threaded the bottom section starting with raspberries, then marshmallows. Alternate these rows and end with five rows of blueberries. The next step is to do the stripes part of the flag. 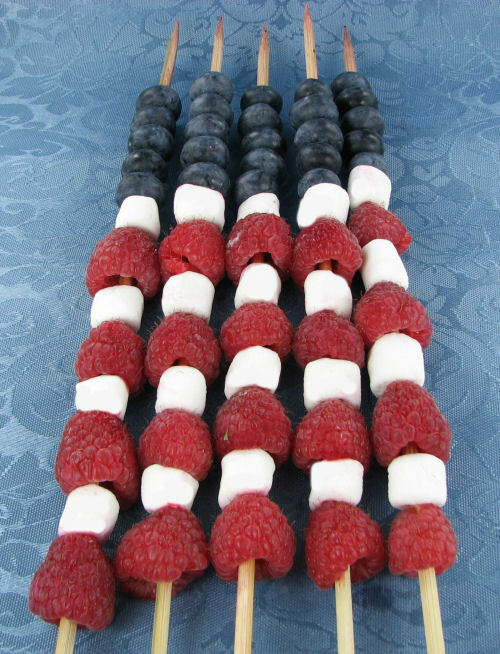 You will make 11 skewers of alternating raspberries and marshmallows, starting and ending with a row of raspberries. My flag ended up with an extra stripe to get the whole thing to line up correctly, but no one noticed. Add your mints around the flag for the festive 4th of July look. The trickiest part of the project is getting the marshmallows to line up well, and also to not get the juice from the raspberries onto the marshmallows and turn them pink. Try to use raspberries that are not too ripe for the best effect. 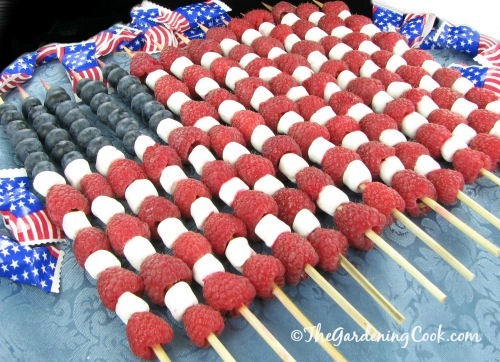 **Tip: if you do not want to use as many raspberries to save cost, you can make a miniature version of the flag with less rows. It will still be red, white and blue and not as tall or wide but won’t cost quite so much. Happy Fourth of July everyone!~ Be safe…..